Have you noticed the recent increase of programs talking about how much money you can make treating sleep apnea? Any day I expect to start seeing infomercials with a dentist on his yacht surrounded by his bikini clad dental assistants with a martini glass in his hand saying "you too can be a dental sleep medicine multi-millionaire. Just sign up for my DVD series and I'll teach you all my tricks." Often a model of billing "out-of-network" obscene fees to medical insurance and "writing off" what the patient owes is recommended. The bad news is, not only is this unethical, it is also illegal! On top of that, it gives all dentists doing dental sleep medicine a bad name with the insurance companies and the medical community. If your goal is to become a dental sleep medicine multi-millionaire as quick as you can, in order to move away someplace where no one knows you (ideally before you've had your license taken away or been put in prison) then our program is NOT for you. However, if your goal is to learn how to do dental sleep medicine the right way (which we define as treating all of your patients the same way you would want to be treated, or the way you would treat your own mother or daughter) then keep reading. What's this TMD stuff?! I thought this was a dental sleep medicine course! ﻿Dental sleep medicine is easy...as long as you're an expert in TMD! Not only is there a correlation between TMJ problems and sleep apnea, but some people with TMJ problems will IMPROVE significantly with proper treatment of their sleep apnea (if they are found to have sleep apnea). 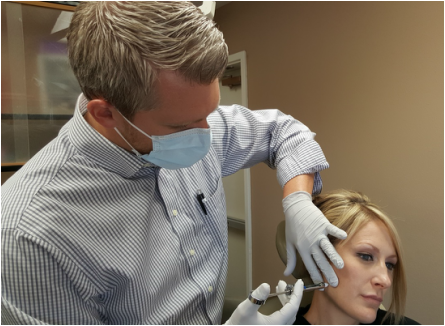 We do NOT believe that properly performed oral appliance therapy is a significant cause of TMJ﻿ disorders. However, it is critical that you understand head and neck anatomy and how to evaluate, diagnose and treat the most common TMJ disorders, such as capsulitis, myofascial pain dysfunction and myalgia, and know how to deal with internal derangements. In this program we will cover the basics of evaluation, diagnosis and treatment of the most common TMJ disorders, as well as teach you how to perform diagnostic injections and trigger point injections. Get Your TEAM Educated, Empowered and Excited! The secret to success when implementing Dental Sleep Medicine into your general dental practice is having a staff that understands the importance of sleep apnea, can discuss sleep apnea with your patients, and has the skills to take excellent records, fit oral appliances (where allowed by your state board of dentistry), adjust oral appliances and help with follow up. This program will have a simultaneous HANDS-ON clinical staff training where your assistants will learn from our experienced staff how to screen patients for sleep apnea, how to talk to patients about sleep, how to take bite registrations and other records, how to fit and adjust appliances and how to make a chair-side thermal plastic morning repositioner. Your office staff will learn the basics of medical insurance billing from our insurance specialist who has over 15 years in the medical insurance industry. They will also learn how to approach working with the medical doctor's staff to get important records for billing medical insurance...and they will learn the way to bill ethically and morally, to keep you out of prison! As part of your tuition you will also receive a jump drive with dozens and dozens of forms, consent, patient instructions, letter examples, etc. These have taken us 20 YEARS to develop, and are given to you at no additional charge, saving you thousands of dollars in time, energy and payroll to create these things from scratch. The lecture will occur at our Boise office and at the Hyatt Place near our office. The Hyatt has reserved a block of rooms for us for a special rate of $99/night. We can help you with hotel reservations. Breakfast and lunches along with snacks during breaks will be provided. If you have a little extra time before or after attending the program, take advantage of our long summer days in Boise by arranging activities from golfing to whitewater rafting, or try your hand at fishing at Redfish Lake by the Sawtooth Mountains﻿ (pictured below). Tuition is $3295 for doctors and $595 for each staff member attending with doctor (call if more than one doctor from the same office would like to attend). A very limited number of dentists will be able to shadow Dr's Spencer and Kuehne while they see patients the day before the course. If you are interested, please call immediately. Value Guarantee: If by the end of the first day you do not feel that you have already received tremendous value, present your course materials and forms jump drive to Dr. Spencer or Dr. Kuehne and receive a full refund of your tuition. Dr. Spencer is a Diplomate of the American Board of Dental Sleep Medicine, the American Board of Craniofacial Pain, and the American Board of Craniofacial Dental Sleep Medicine. He is one of the founders and instructors of the Tufts dental sleep mini-residency program and of the newly created University of the Pacific dental sleep mini- residency. Dr. Rasmus is a board certified sleep specialist in the Boise area. He has conducted clinical research and has published articles on sleep disordered breathing. He believes strongly in the use of oral appliances, and in the connection between OSA and bruxism. Dr. Kuehne is a Diplomate of the American Board of Dental Sleep Medicine, the American Board of Craniofacial Pain, and the American Board of Craniofacial Dental Sleep Medicine. He holds leadership positions in the American Academy of Craniofacial Pain. To register for this course, please call 208-376-3600 Today! No! There are a lot of EXCELLENT programs out there that are teaching the correct way of doing things. Dr. Spencer is the director of dental sleep medicine mini residencies held at Tufts in Boston, and UOP in San Francisco. Other great programs to consider are those offered by the AADSM (aadsm.org) or the AACP (aacfp.org). Spear in Scottsdale has a great introductory program. Jonathan Parker puts on a fantastic course at his office. Jon Tucker's courses with Schein are super. Steve Carstensen is awesome and teaches at Spear and Pankey. Somnomed does a wonderful job with their intro courses. Rose Nierman has been teaching correct principles for years! And this isn't a complete list. We are NOT implying that we are the only place that you can learn to do things the right way, but unfortunately the courses teaching how to do things the wrong way have WAY better marketing than the courses teaching the right way. Again, just ask yourself, how would I want to be treated? How would I treat my own wife, daughter, mother? Do I want to be admired and trusted by my medical colleagues? Do I want to be certain to be doing things "above board" and not get in to any gray areas that could be catastrophic to my practice and family? Is the course actually just a way to try to sell me tens of thousands of dollars of equipment that others don't seem to need? Am I being told that I am guaranteed to start seeing 50+ new patients per month, and collect 4K+ per case, even though I live in a town of 10,000 and the local insurance companies don't offer out of network benefits? Be smart. OSA isn't going anywhere. As dentists we can do so much good for so many people. As Steven Covey said, there is never a wrong time to do things the right way. Build a strong foundation that will support your practice and your patients for decades to come. Have a question? Contact Dr. Spencer About Our Meeting Today!